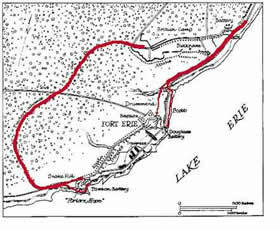 The Siege of Fort Erie of 1814, at which a Captain John Bradbridge was taken prisoner (probably John Jones Bradbridge), was one of the last miltary engagements between British and American forces during the Niagara campaign of the Anglo-American War of 1812. It was a long and protracted siege, which has the status of being the bloodiest single conflict to have been carried out on Canadian soil. The Fort Erie site was first occupied by French fur traders in 1753 but in 1764, shortly after New France was ceded to Britain at the end of the Seven Years' War, the British constructed a military fort on the site. 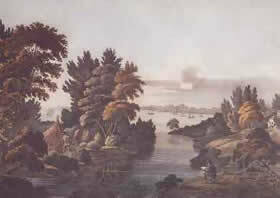 The Fort Erie that was familiar to John Bradbridge was actually the third fort to be built on the site, the first and second forts having been destroyed by storms in 1779 and 1803 respectively. The third fort was still under construction in 1812 when war broke out with the Americans. During 1813 and early 1814 the site exchanged hands a couple of times but decisively fell into American hands on 3rd July 1814 when 4,500 Americam forces, under General Jacob Brown forced the Britsih garrison of 137, under Major Thomas Buck to surrender. A large portion of the American force subsequently advanced northwards towards Lake Ontario, defeating the British at the Battle of Chippawa on 5 July. However, on 25 July they were defeated at the battle of Lundy's Lane near Niagara Falls and, now under the command of Brigadier Eleazer Wheelock Ripley, were forced to retire to Fort Erie. 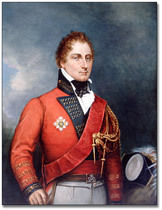 Of key importance is that the British, under the command of General Sir Gordon Drummond (below), were extremely slow in following up and assuming a siege position, allowing the Americans to expand and strengthen their defences with a V-shaped redan, a dry ditch and a palisade. The British commenced bombardment of the fort on August 13th but without having had significant success in breaching the fort's walls, Drummond unwisely decided on a risky three-pronged night assault. The result was a disaster. The first column under Lt Col Victor Fisher of de Watteville's regiment were mostly taken prisoner, whilst both Lt Col Hercules Scott and Drummond's nephew, Lt Col William Drummond, in charge of the other two columns, were both killed in the assault. Although the British forces managed to gain control of part of the fort, during the fighting an ammunition chest caught fire and exploded, killing a significant part of the British force. The survivors surrendered to the Americans, with British forces in the meantime having lost a total of 366 killed or wounded and 539 missing. Following the failed assault Drummond continued to stand his ground although the siege degenerated into a series of small assaults and counter assaults. On 17th September, though, the American forces, now once again under the control of Major General Jacob Brown, conducted a full scale sortie, during, which two of Drummond's batteries were destroyed and a further 600 men were lost. It was during this sortie that Captain John Bradbridge fell into the hands of the American forces. Following two weeks of continuous rain, the British forces retreated to Chippawa burning their bridges behind them. The American forces, however, did not follow up their advantage and indeed Major General George Izard decided to abandon the fort and ordered it to be mined and the artillery removed. Following the withdrawal of the garrison, the buildings were set on fire and the mines detonated on November 5. The British decided not to rebuild the fort and indeed, despite serving as a barracks for several years, the site was completely abandoned in 1823.